At each port the Delta Queen calls on during her 2008 season, a “Tribute Event” will be conducted to thank the city and citizens for their years of hospitality. There’s usually one scheduled each cruise so the onboard guests get a chance to enjoy the festivities. It has been a joy to welcome the mayors and other city representatives from communities along the river to come aboard the vessel for a tour and an event ceremony. We set up a public address system on the Texas Deck bow so area citizens can gather along the waterfront and enjoy the proceedings. The event includes the presentation of a plaque by the Delta Queen’s Captain to the mayor or city representative. The city reps usually also have a proclamation, plaque, key to the city, etc. 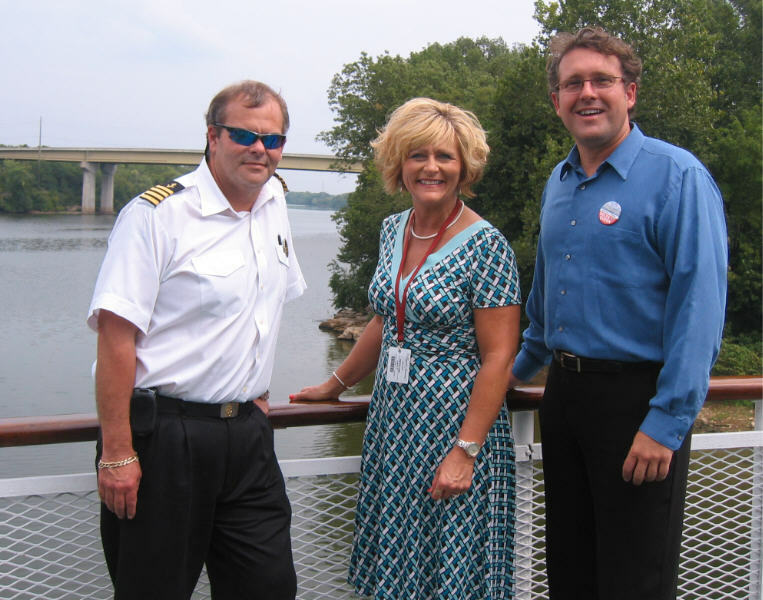 The Delta Queen band, Riverboat Rhythm, plays some music and our onboard entertainers sing. In between songs, I share with the crowd snippets of history about the Delta Queen. I wrap up with an update on the Delta Queen’s struggle to continue service and encourage the crowd to contact their House and Senate representatives to encourage their support. We conclude with a calliope concert as the boat departs. Today we conducted the event for Dover, Tennessee. Dover’s Mayor Lesa Fitzhugh was a delight. I had a great time touring her and several other city representatives around the boat. They were truly fascinated with the Delta Queen and had lots of good questions. Not only did the Mayor present a proclamation on behalf of the city, but we also received a proclamation from the county and another from the Chamber of Commerce. We are so thankful for such kind hospitality and such wonderful warm wishes and enthusiasm.